As with fashion, everything changes quickly. Trends go in and out and we all know they cycle. Styles and trends from the past always come back eventually. Some of these are things left buried in the past (I’m talking scrunchies, y’all). So with that in mind Paisley Raye is retiring some styles to make way for new on-trend styles for your closet. It is bittersweet to see a good (and pretty) thing go but that means new exciting things are around the corner! First we have the Poppy. The Paisley Raye Poppy is a high-low dress with a 10″ sleeve (think elbow length). She is more fitted on top and has a high-low swing hem. Right now she is on her way out for a new dress. Want to grab one for yourself while you still can? Head on over to Be Unique Boutique to grab one at the new low price of $40 now. Next we have the Aster dress. The Paisley Raye Aster is a swing dress with bishop sleeves, pockets, and a cute key hole cut out in the back. She is double-layered so know worrying about seeing through it when you hear that she is made out of mesh or lace. There are a limited number of Asters available so scoop them up at their new low price of $40 right here. Last we have the Nerine Tee. I know, I know, I’m sad too. The Paisley Raye Nerine tee is a scoop neck top with a front knot detail that creates this ever so flattering ruching. She’s short sleeved and has been super popular and we are all sad to see it go, but… let’s get excited for new Spring styles to come. Oh, and the new low price of just $27!! Scoop them up now!!! It’s so hard to write about food and my relationship with it. Probably because it is incredibly unhealthy – the relationship that is. I’ve come to the realization that I use food as a drug for my emotional well being. It would all be fine if I just felt fine, right? I’m a lucky person in that I never had a difficult time with weight growing up. Even in to college I was relatively healthy and active and maintained what the medical world would consider and healthy “in-range” BMI. I fluctuated, for sure, depending on how much physical activity I was doing and how much money I had to spend on food or, yes, alcohol. And then I turned 29 and got sick. It was as if overnight I couldn’t do things that I normally did and took for granted. I used to walk home the 2.5 miles from work every day instead of riding the bus. And suddenly I couldn’t walk to the bus stop in front of my house without feeling like I was going to pass out. I didn’t look any different but I felt like I was on the verge of dying at any given moment. I was diagnosed with Graves Disease and given medications to try to slow down my thyroid but I spent a year with uncontrolled hyperthyroidism on a highest safe dose of medication and other drugs to lower my heart rate and blood pressure. I found myself 30 years old and facing possible heart problems if I kept going the way I was going. I chose surgery. A few months after my surgery. And then that unhealthy relationship with food started having consequences. I realized what triggered what behavior and that the binging I did when I was stressed out or full of anxiety meant actual weight gain because I no longer had a thyroid or any natural metabolism to boost by the tricks I learned my entire previous life. When I was upset or depressed I was never hungry so I starved myself. It happened so many times in my teens and twenties. I would fall deep in to a depression and not eat for days. I would survive on water alone. The thought of food would make me want to throw up. It took so many years but I thought I had finally figured out how to keep myself healthy and keep the doctors from talking to me about my BMI every time I came in to the office. I learned how the body worked with regards to eating and food and fuel. I learned this all from a hypnotist that described everything is such a way that it just clicked and I immediately started to eat her way and I felt better. The hypnotism lasted over a year and I felt great. And then a ton of stress hit me all at once. And I broke down and started binging food that I wouldn’t have been eating. I’ve been so stressed out and full of anxiety for a year and I’ve been trying to fix it would food. And its not going to work and it never will. I’m making a commitment to go back to eating the way I did post hypnotism. I felt better and had more energy and I think my moods were in better control then as well. Autoimmune disease is a struggle. I will forever be on medication and getting blood work to make sure I’m on the right dose. I’ll have a lifelong battle with weight gain and loss. I’ll have times where I’m depressed or lethargic just because my medication is wrong. But the best thing I can do for myself is to love myself the way I am and start to repair the relationship I have with food. I can’t wait to start. A word of the year can be daunting to think about. It’s like a New Year’s Resolution but I think it is better. Gone are the days where you vow to eat less sugar or exercise more or the generic “lose weight”. In the past I have never really been in to New Year’s Resolutions. I never stuck to anything I chose at the end of December past the beginning of February. I’ve actually completed two Whole30’s two January’s in a row. And both times as soon as it hit Day 31, I was eating whatever the heck I wanted again. Lets talk about exercising as a resolution. Yes, I’ve been a very active person for the majority of my life but there are moments where I stopped doing anything. I’m actually in one of those now. I hurt my back and used that as an excuse to stop doing pretty much anything. I also use the excuse of wanting to work on my business in that hour or so that I used to go to CrossFit in. So I moved on from the get healthy, lose weight New Year’s Resolutions and went for something different. A few years ago I made the resolution to go outside of my comfort zone more. This was the first time I was able to stick to something. I am an introverted extrovert. I like people as long as I know them already and they make it easy for me to be extroverted. Get me in a crowd with no one I have ever engaged with before and I panic. I am forever suffering the “alone in a crowded room” scenario. But I forced myself to go to events I wouldn’t normally say yes to and places I would never have gone without a buddy planted so that I knew I had someone to talk with. And yes, I didn’t die. Of course, I had those moments of sheer terror as I sat alone at a networking event for the entire thing. I had those scary moments where I thought everyone was looking at me and wondering why I was all alone. And then I had those great moments where I met new people and made amazing new friendships. The following year I resolved to use my passport more. And I did. I traveled so much that year, it felt like I was barely home. It was amazing to see new places I had never been before and I keep planning new trips and adventures in the future. I still need to combine the going somewhere alone with my travels but baby steps right? So why is personal growth and development easier to stick with than other New Year’s Resolutions? I think it has something to do with how you view the decision. Change is hard but when you pick small things that you can weave in to your normal routine, it seems to be easier to keep. And that brings us to choosing a word for the new year. 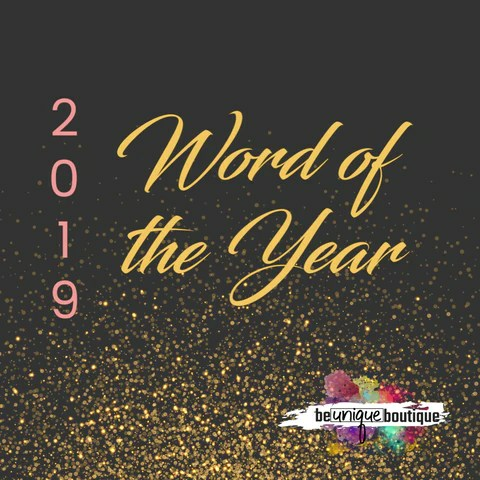 So why should you choose a word of the year? A word of the year is simple in that it is one word that you can weave throughout your life during the entire year. You can remind yourself of why you chose that word and it tends to stick with you in both good and bad times during the year. When choosing a word, be sure to think about how you connect with the word. It’s a very thoughtful process and shouldn’t just be chosen lightly. You need to reflect on the past year and what you think should be your focus for the coming year. And don’t think that you have to only have one word. Often times few words work for you and that is okay. Perhaps one word works for you professionally but another word works for you personally. Why limit yourself? Choose two! I had a difficult time trying to choose a word for 2019. I had heard of choosing a word before but this was the first year that I was committed to choosing one. Many words jumped out at me but as I thought about them, I felt like I was copying other people and their choices and not being my authentic self in choosing my own path. You know its always easier to walk in the footsteps that someone has already put down for you. My word came to me at first on a mug (YAY RAE DUNN) but I denied it because I thought of that particular word as negative and pushy. I wanted my word to be about accomplishing goals but I didn’t want it to scream ARGGGGG!!!! I saw words like commitment and grace and I was bummed I couldn’t think of anything that clicked. I thought about heal for about a week because 2018 was a year of struggle and transition both personally and professionally. I really thought healing was a great choice but again this other word kept creeping back in to my life. 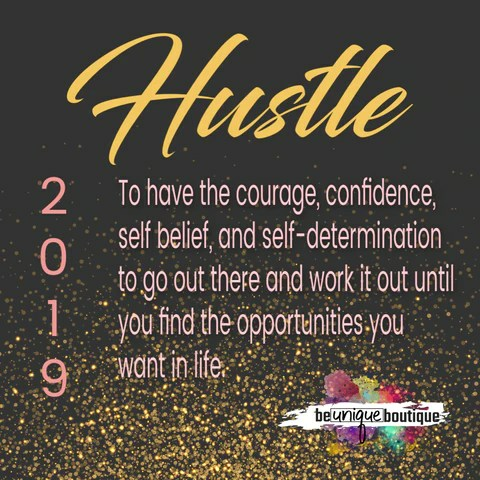 My word for 2019 is HUSTLE. And what sealed the deal for me was the top definition for the word on Urban Dictionary of all places. Crazy!!! But this word speaks to me and this definition is what I want my 2019 and beyond to be about in all aspects of my life. Why Paisley Raye? And why leave my first clothing business for it? Hello friends!! 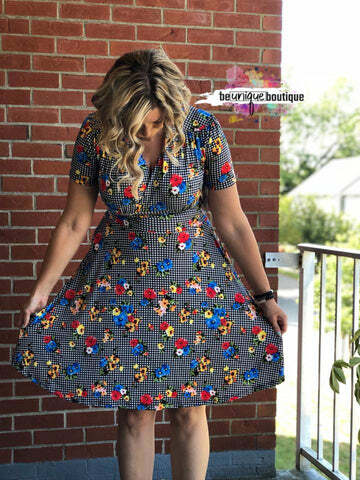 I’m Jennifer Clair and I’m the owner and founder of Be Unique Boutique. I used to be a retailer for another incredibly popular clothing direct sales company. It was my side hustle as I work full-time in healthcare administration. The thing is I wasn’t very happy after a year of selling clothing. I thought I was but I’d get discouraged with things going on in the company I was representing and I never really acknowledged it. And then I found Paisley Raye. I didn’t really know what I was getting myself into but I started trying on their clothes at a conference and all of the sudden it clicked. I might have spoken the words “questioning my life choices” a few times. I hadn’t realized how unhappy I was until that conference. I also had absolutely no idea I was talking to the co-owners of the company in that booth space as I tried on all the things. I bought one dress (Hello, Dahlia!) and I got home and reached out to my newest friend from that conference who had done just the thing I was considering doing. I was in the PR queue within a week. The moment I realized I made the best decision and was in the right place was eye opening and a bit personal. While I was at that conference my youngest sister was being treated for Breast Cancer and had developed some rib pain. Scans were done and she was headed for a kidney biopsy while I was across the country. I was sad. I was worried. I was trying to really live in the moment in a place I had never been before and focus on personal development but as a worrier of an oldest sister, it weighed on me. When I shared my story with some new friends, the love and support from the others at the conference was overwhelming. When I returned home to Boston, the results came back that my sister had kidney cancer on top of the breast cancer she was in treatment for. So I shared this news with my new friends. Little did I know, Ruth and Christi were in that group on Facebook. When I got that personal email from Ruth asking about my sister, I knew I was home. The genuine love and support I got and continue to receive from Paisley Raye is more than I could ever dream of. And I’m not going to tell you that leaving a business for another one is easy. I’m still trying to liquidate my prior inventory but I’m so incredibly lucky and grateful that I found Paisley Raye when I did. It took me off the ledge I was standing on and filled my cup. You see, I’ve never felt like just another paycheck in this company. I’m a valued family member in the Paisley Raye Family. And I wouldn’t give that feeling up for anything. Want to learn more about joining Paisley Raye? Come read all about it!